As Ganapati festival is nearing, I am sure many of you might have started preparations for the festival. Steamed Modak called Ukadiche Modak and Fried Modak are mostly prepared for Ganesh Chaturthi festival in Maharasthra. 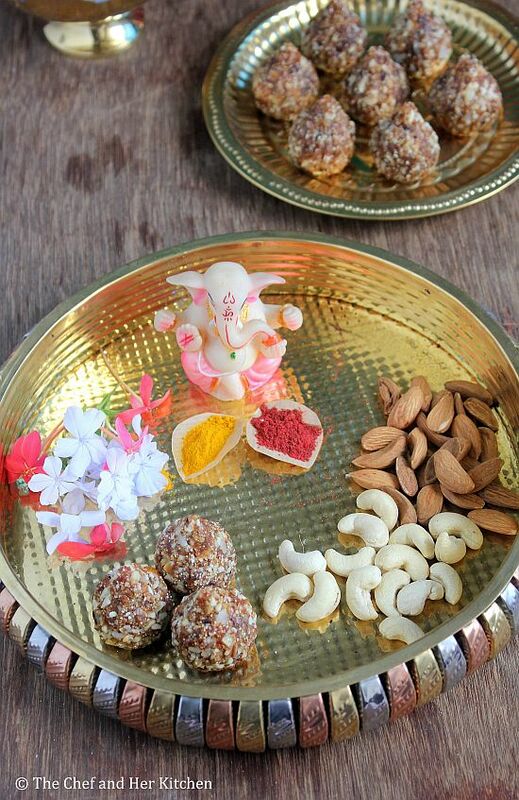 You would see various flavored Pedas like simple doodh peda modak, dry fruits modak, chcolate modak, mango modal, kesar modak etc shaped in the form of Modaks in most of the sweet shops during Ganesh Chaturthi. I have posted a Paneer Modak Peda recipe last year and this year I thought of posting something simple and hence chose Dry fruit Modak recipe. 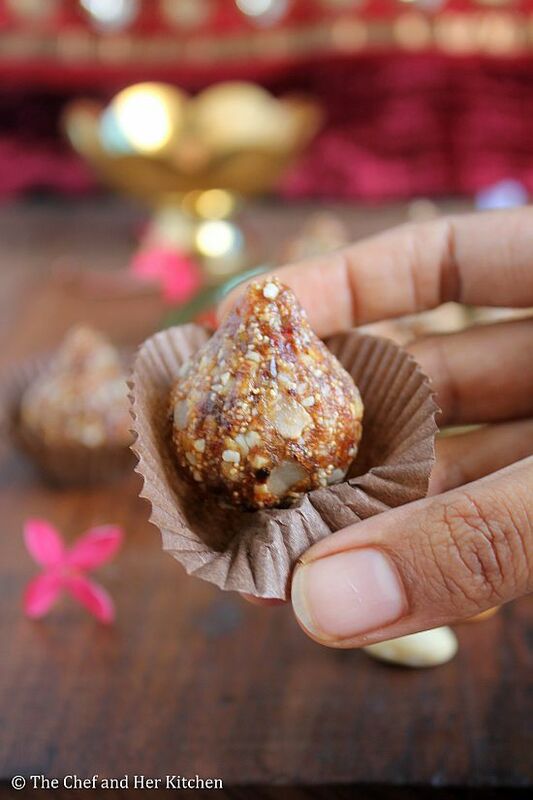 I have posted a version of Dry fruits- Oats Ladoo recipe earlier and I have prepared this dry fruit modak in a similar way with few modifications. The modak mold gives a nice shape to it which makes it look even more appetizing. This recipe is definitely a boon to those calorie watchers and also for those who are looking for quick sweet recipes for Ganesh chaturthi. More over you can prepare this much ahead so that you need not worry on the festival day. 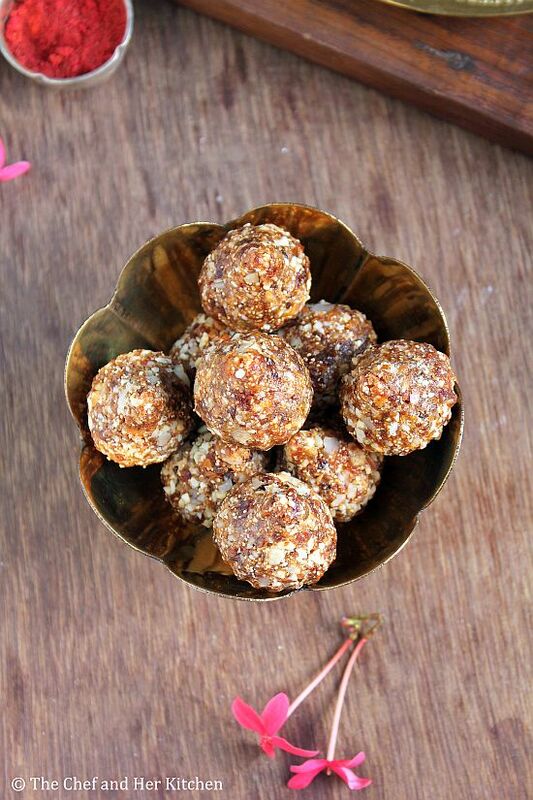 If you want to make it on normal days, prepare it in the form of ladoos instead of modak and can be packed in your kids snack box. It is a really healthy recipe with no sugar and almost no fat. As my mixture was a little chunky you cannot see the design exactly like how the regular modak would be, but modak mold works very nicely for simple plain peda with a lovely pattern on them. 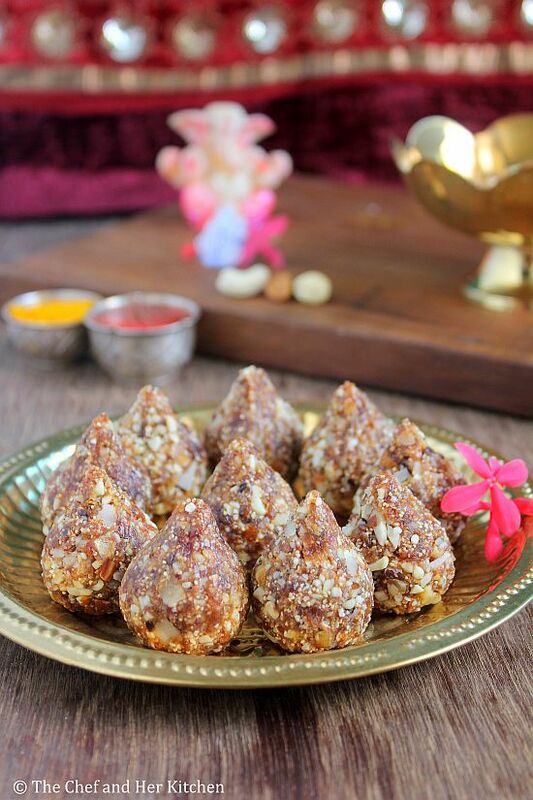 Try this simple Dry fruit modak recipe for Ganesh Chaturthi and enjoy!! I had a tough time capturing these photos as the brown food is very difficult to capture, I am not very happy with the photos. 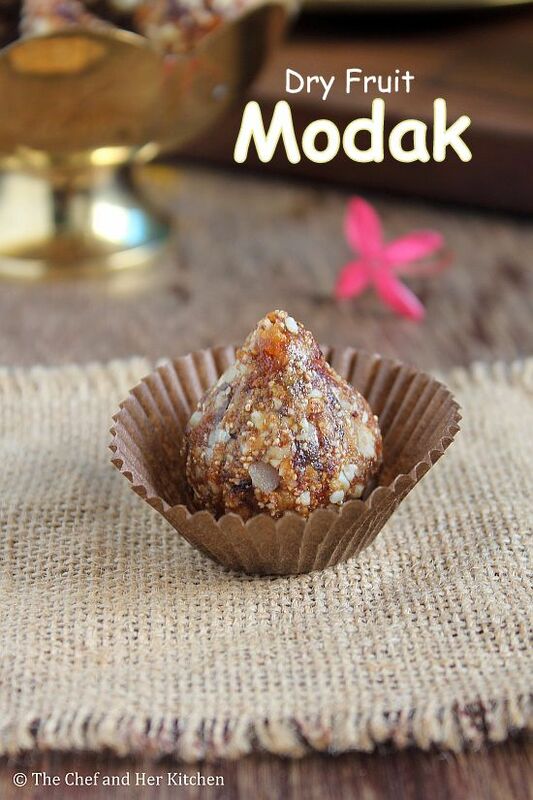 But it did not stop me to share this easy and delicious Modak recipe.Try this simple Dry fruit modak recipe for Ganesh Chaturthi and enjoy!! Chop all the nuts - cashew nuts, almonds and walnuts finely. Also chop the seedless dates and dry coconut pieces to fine pieces. Dry roast the chopped nuts one by one separately for 1-2 mins taking care that they would not get burnt, remove them and keep aside in a plate. Dry roast coconut pieces until they turn slight brown in color and remove them aside too. In the same pan add poppy seeds and roast them slightly until they start popping, remove and keep aside. Heat ghee in the same pan and add chopped dates and raisins and fry continuously until it comes together and becomes like a thick mass.This takes 4-5 mins roughly. Do not leave it unattended as the raisins might get burnt. Switch off and let it cool slightly. Grind the roasted nuts with dry coconut pieces and poppy seeds to a coarse powder in pulse mode. I like the bite of dry fruits, so I do not powder them completely and hence keep them very course. It is your wish to grind them how you want.Remove the mixture aside into a plate. Now add the date-raisin mixture and pulse it in the mixer to get a coarse mixture. Again it is you wish here to grind it smoothly or keep it coarse like I did. Take out the mixture into the same pan and add coarsely ground nuts and mix nicely and bring it back on the flame and stir continuously for 2-3 mins until the mixture becomes slightly sticky and hold the dry fruit mixture nicely. Remove the mixture into a plate and let it cool slightly until you can handle with bare hands. Press the mixture slightly hard to form a sticky mass. Make gooseberry sized balls out of it and place them in a modak press(as shown in pic) and press it tightly by levelling the down and pressing it firmly to get modak shaped ladoos. 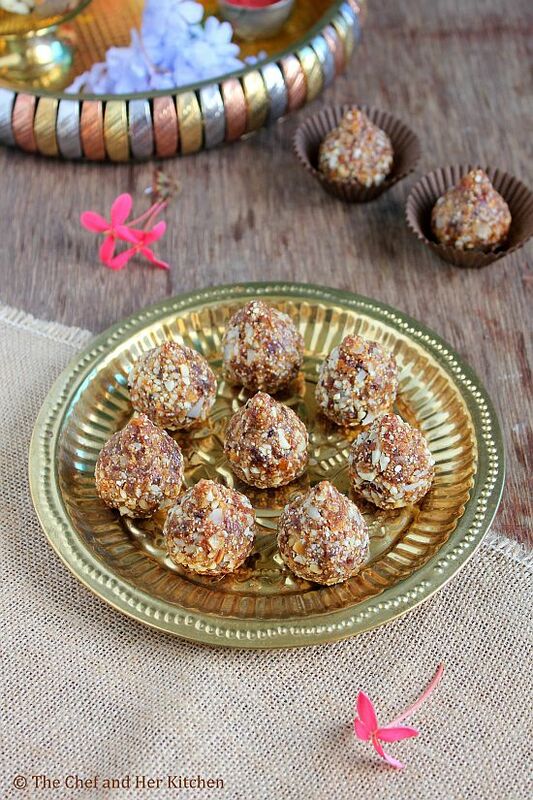 If you do not have modak press you can make into ladoos. Prepare all the modaks(ladoos) and store them in an air tight container. Serve it as it is as a snack/dessert. You can add nuts like pistachios or any other nuts of your choice. Anjeer(figs) can also be added along with dates, in that case reduce the dates to 1 cup and add 1/2 cup of figs and follow the same process. If you like cardamom flavor add 1/4 tsp of Cardamom powder to the mixture when you are mixing it. There are no hard rules for this recipe, you can make it a per your wish. 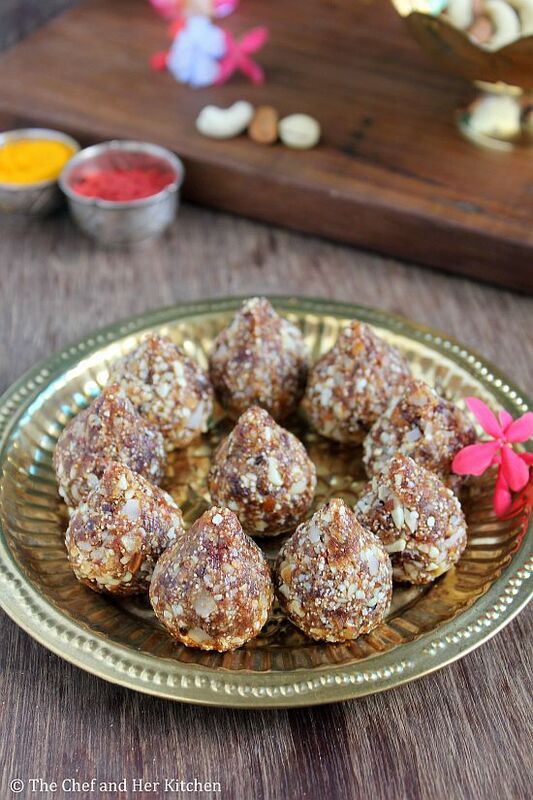 You can grind the mixture smooth to get smooth modak(ladoo) or keep it coarse to enjoy the dry fruit bites. 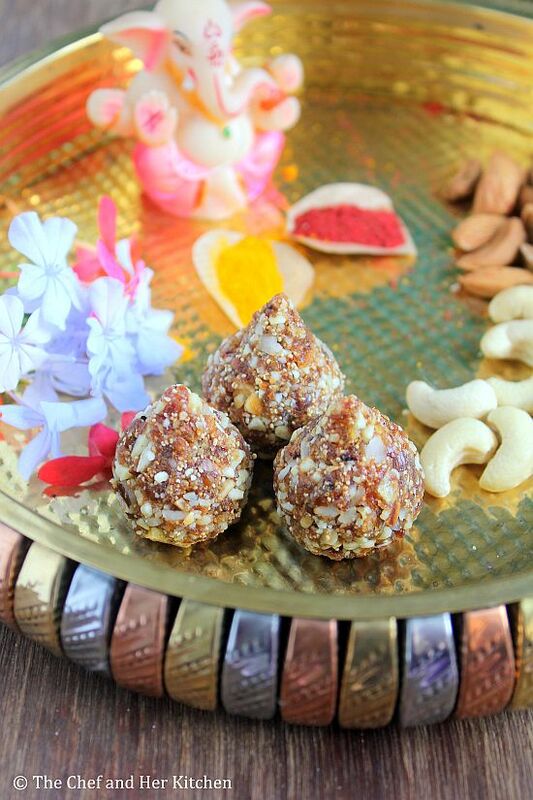 You can even alter the nuts and dry fruit quantities according to your wish, the mixture should hold its shape when we try to make ladoos. You can store them up to a couple of weeks. 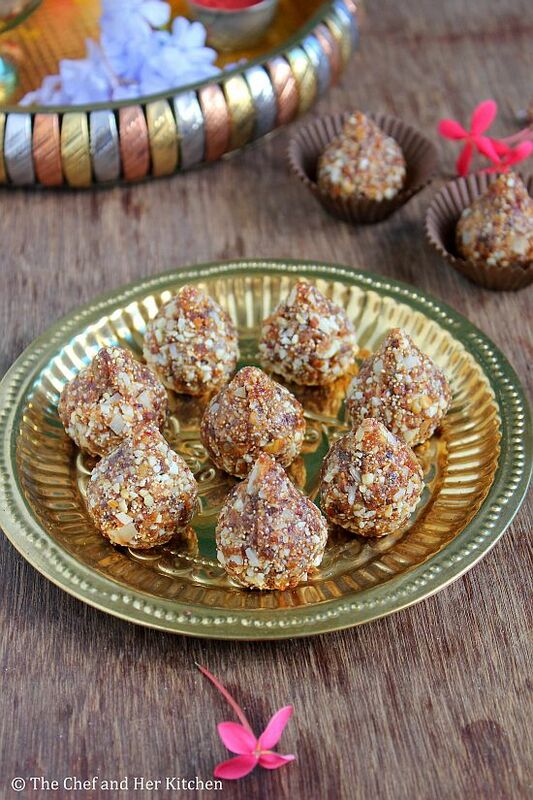 I have made this many a times but in shape of laddoo... a little bit of variation...will post it soon! These look cute and yum! Nice, I add some honey to give the binding. Curious to know where I can buy the modak press ?